Babies in our digital age grow up – literally – with technology even before they actually make their first appearance in our world. Babies still developing inside the womb use twitter to tell the follower-ship when it made another kick via the Kickbee maternity dress. 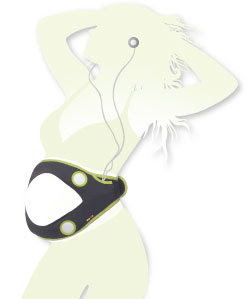 Unborn babies listen to music via their expecting mothers Bellysonic belt and show the outside world it’s movements via the NEMO monitoring belt. The latest addition to unborn baby’s gadget collection is the recently headline capturing Ritmo pregnancy sound system. Unlike Kickbee and NEMO which are not yet on the market, the Ritmo is available for $129.99 and gives not only access to your very little one to music by connecting to most audio devices such as iPods and other MP3 players but also to the iPhone and Blackberry. Finally the father can get in touch with the very little one assuming the expecting mother is wearing this space age pregnancy sound system.